To add citation to a text editor, including Google Documents, right click on the paper you wish to cite, hover over Copy As and select Formatted Citation. Or select the article that you wish to cite and press CRTL + SHIFT + C. This will copy the citation on to your clipboard, for you to paste in Google Documents, MS Word, or whatever text editor you using. You can also select and drag the document you wish to cite into your text editor of choice to generate a citation as well! Clicking on Insert Citation will allow you to search for a citation to include by author, title, or year in your library. Additionally, you can go directly to Mendeley from there. Select the article you wish to cite, and Mendeley will generate an in-text citation. 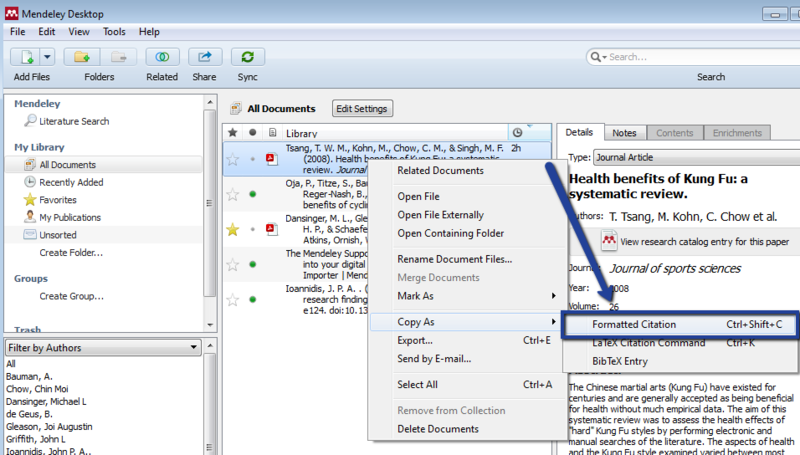 To generate a bibliography, select Insert Bibliography and the Mendeley Cite-O-Matic will generate a list based on the in-text citations included in your paper. 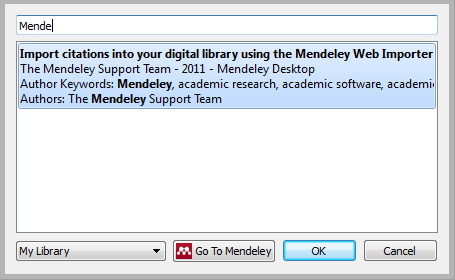 To see a more detailed tutorial for usage in MS Word, refer to the brief tutorial by Mendeley below.